The second day of the Latin Cup in Saint-Omer reduces the number of teams that can win the cup to two only: Spain and France. This happens even if the two teams had very different results today: Spain clearly won against Portugal while France suffered its first loss against Italy. 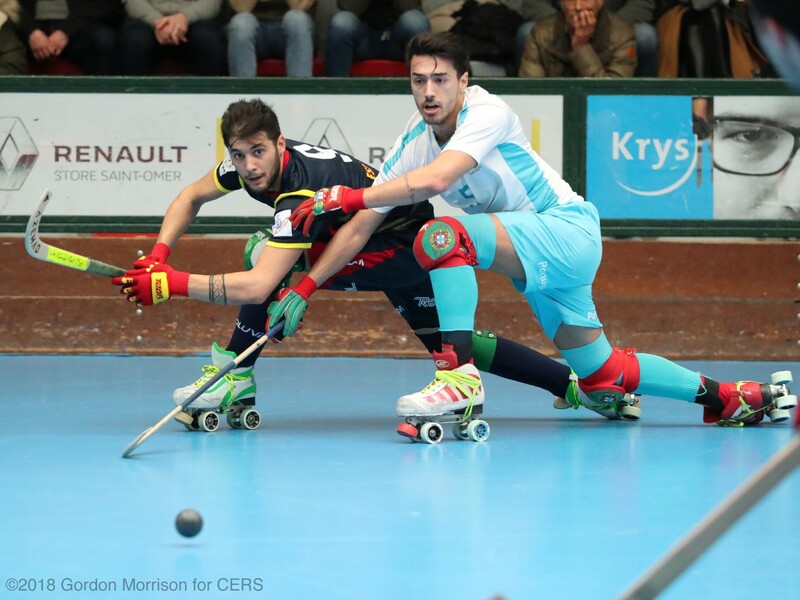 “El clasico” of the rink hockey between Spain and Portugal converted in a one-way match. The Spanish team, as done the day before with Italy, dominated the game, perhaps in a clearer way. No doubt that Spain offered to the audience the best hockey during this two day (but the Cup is still a step ahead). At the halftime, Spain was ahead 6-1 against Portugal and the final result was a stunning 9-4. After only two day match, is sure that Portugal will not win again after the triumphs reported in 2014 and 2016. Neither Italy can win the Latin Cup, despite the clear (and surprisingly, after the results of Thursday) victory against France. After a balanced first half, Italy played at its best during the second, scoring three times while its goalie, Bruno Sgaria, saved many French attacks. France wasted many opportunities during the match, failing lots of free hits and hitting posts and bars. Nevertheless, the home team is the only one that can still compete with Spain for the title. The situation of the standing is quite complicated and the final result of the whole tournament (from the first to the fourth place) depends on both the games of tomorrow, Sunday, April 1. Of course, if Spain wins or ties the game against France it will get the title. If France stops Spain, the final standing could depend on the result of Portugal-Italy. In fact, if Italy loses or ties with Portugal, a victory of France over Spain will give the title to the home team, with any result. On the contrary, if Italy wins against Portugal, France need to win against Spain with at least four goals of advantage, or Spain will have the title. If the first place is still unassigned, it’s the same for the other places. The only certain thing is that Portugal and Italy cannot win the title. Everything else could happen tomorrow. Spain 6, Italy and France 3, Portugal 0.